The answer is actually simple but brilliant: in putting the birthday card together, use elements the kids actually love. In other words, apply their favorite heroes, dolls, princes, princesses, cartoons, comics, and various other characters into the cards. In the past, you had to actually draw the characters for the card. This was a big concern especially if the drawing looked nothing like the actual character. However, these days, there are simpler methods that save you time. For instance, there is probably a rubber stamp for that character the child already loves. Therefore, there’s no need to sketch anymore unless you just want to. All you have to do is color the stamped art afterwards. Don’t want to color the art? Not to worry. There are even stickers, 3-D pieces, and other essentials available in the craft stores as well. What type of color medium suits best? Is the color too bright or too dull that it throws the rest of the card off? For instance, I made two artworks from the rubber stamps. One using colored pencils and the other with felt pen markers. Then I compared them to the pink cardstock paper. So, I went with the felt pen marker art. Because the cardstock paper was a little brighter than the colored pencil art. However, If the kid loves even brighter colors, there are other options. Examples are ultra-bright colors like neon cardstock papers, colored pencils, and felt pen markers. Don’t forget to use the craft heat gun on the stamped ink before coloring. This makes the stamped ink more permanent. Therefore, preventing the stamped ink from messing up the work by mixing with the colored pencils and markers while you paint. A little glitter, “bling,” or other shinny stuffs here and there is always a great idea. However don’t overdo it unless that’s what the kid wants. For example, there isn’t any glitter on this card. However, the little shimmer from the silver ink letters is subtle and sufficient. How about the edges: straight or decorative? bland kids birthday cards are not always appealing. Instead, embellish cuts and decorative edges are cooler. And the child will love it. 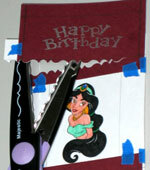 For this card, there are decorative edges from the majestic-shape scissors. Plus, there are curved corners from corner trimmers. Bottom line, feel free to make the card as creative as you want. 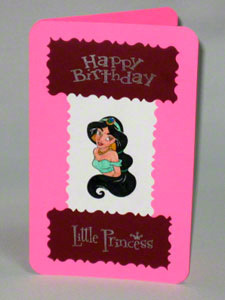 At this point, hope you are ready to make wonderful kids birthday cards? So have some fun plus put a smile on the young celebrant’s face. Want the decorative cut edges to align afterwards? One trick is to cut the adjacent edges at the same time. To do this, on each piece of paper, draw pencil guidelines that represent the edges of the cut. Then align the pieces on top of each other with the guidelines. Next, hold the pieces together with masking tape before cutting. Finally, make the cut then gently remove the tapes. Remember to erase the pencil marks afterwards.